We had the pleasure of staying at this excellent site at Easter in 2006. The staff are excellent and are always keen to help out if and when needed. During the winter break the site has had some extensive work carried out including the refitting of the mains electric pitches and refurbishment of the amenities, which are looking great! This is one of the first sites I have ever been on that provided tea and coffee making facilities in the Laundry, washing up areas and it was certainly a big hit with fellow campers as was the abundant supply of books and magazines which you may borrow while you are on the site, this also turned this area into a wee meeting place as campers and caravanners chatted away while doing their chores and enjoyed a wee cup of tea. I am sure this will be one idea that will be passed around the camp sites in the future. The site is set amongst the highlands just a few miles from Inverness, with plenty of places to see and things to do in the area it is best to make this at least a weeks break in order to make the best of the area. There are plenty of brochures on hand in the Laundry/washing up area next to the kettle etc. And of course other campers will let you know what they have enjoyed on their trip as well. The best day out for me was a trip up the Cairngorm's via the Funicular railway, the views on the ascent and descent are astounding but the view from the top is like being on top of the world, totally awesome! The weather overall was very good to us and we managed to get out and about every day we were there and returned to the site mid evening for the BBQ and relax taking in the view of the surrounding mountains, which were snow covered for most of the time. I know I say this a lot in my reviews but yet again this is a site that we look forward to visiting again and again in the future, with great staff and brilliant surroundings it really is another spot that we will enjoy for years to come. 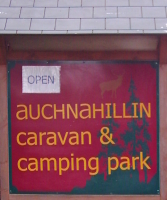 A great big thanks to all at Auchnahillan for making Easter 2006 a holiday to remember!